Entering the Phuket Art Village, a small enclave of artists found hidden away down a narrow road near Nai Harn beach on Phuket, is like stepping into a childhood storybook. A collection of rustic, hand-built art studios in a kaleidoscope of colours are arranged around a giant banyan tree. Piles of wood, the scent of oil paints, walls made of painted recycled wood or wallpapered with flip-flops or lined with hundreds of plastic bottles. Half-finished canvases with swirls of colour propped against a wall. Huge murals of animals, a life-like sculpture of an opium smoker, plastic jellyfish chandeliers, a painted surfboard … at every nook and cranny there’s captivating objet d’art or a work in progress to see. The art village overall has an eco-conscious character with beaches, the ocean and island life playing prominent roles in many creations. The setting is relaxed and casual. Anyone is free to show up and have a look around, and most of the studio doors are invitingly left open even if the artists are out. Since it was built about seven years ago, the village has seen artists come and go. On our most recent visit we met one artist and explored the studios of three others who were not on site at the time. 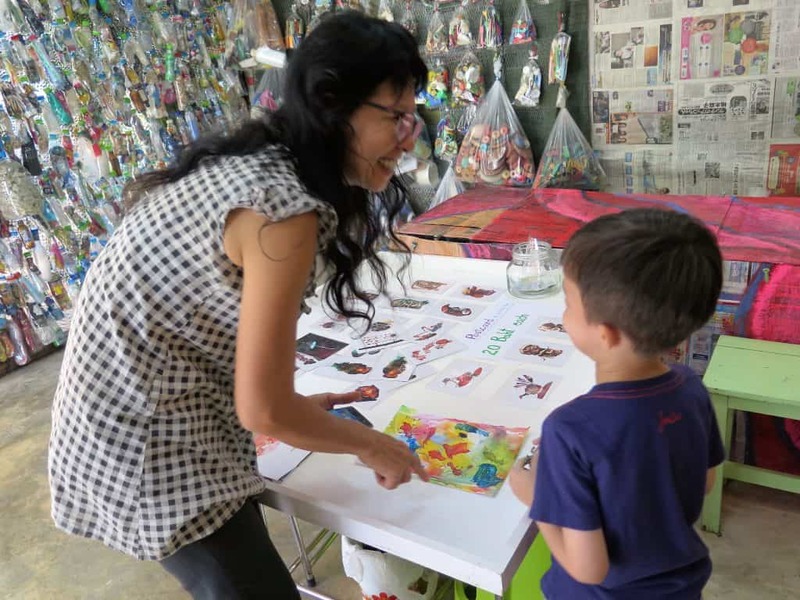 A children’s eco-art workshop at Prasopsuk Gallery, Phuket Art Village. One of the newer arrivals to the village, Khun Prasopsuk, better known as Ajarn (Teacher) Pom, uses her art to spread the message of eco awareness. We met her on a day when she was hosting a free workshop for kids at her studio, who were busy making paintings with sea life imagery. Born in Bangkok, but living in Phuket for more than 20 years, Ajarn Pom’s art has taken her around the world. After teaching at a Montessori school in Thailand for three years she moved to Bosnia-Herzegovina. Recycled shopping bags she designed created a sensation large enough to be featured on TV there. In late 2004, Ajarn Pom was working as a portrait sketch artist at Nai Harn beach. One day in late December, she had an appointment elsewhere so she didn’t arrive at the beach in the morning as usual. 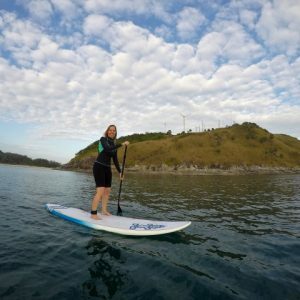 Soon enough, her phone rang with panicked calls from friends when the tsunami waves struck the island. In the aftermath, she travelled all over Phuket to help in the cleanup, and was shocked by the amount of garbage that had washed ashore. From that day onwards, her life became a mission to educate others about the environmental damage caused by waste. She regularly visits local schools to hold eco workshops and has exhibited her work at the Bangkok Art and Cultural Centre and elsewhere. Her studio is a showcase of her eco art, adorned with eye-catching works made with fishing nets, plastic bags and bottles, plastic dolls, bottle caps, bits of metal and wood, and other items she’s found on her beach cleanup walks. The most striking are her jellyfish lights and tropical fish wall hangings made from brightly coloured plastic waste. Can’t miss this one. The cheerful and colourful Love Art Studio, Phuket Art Village. 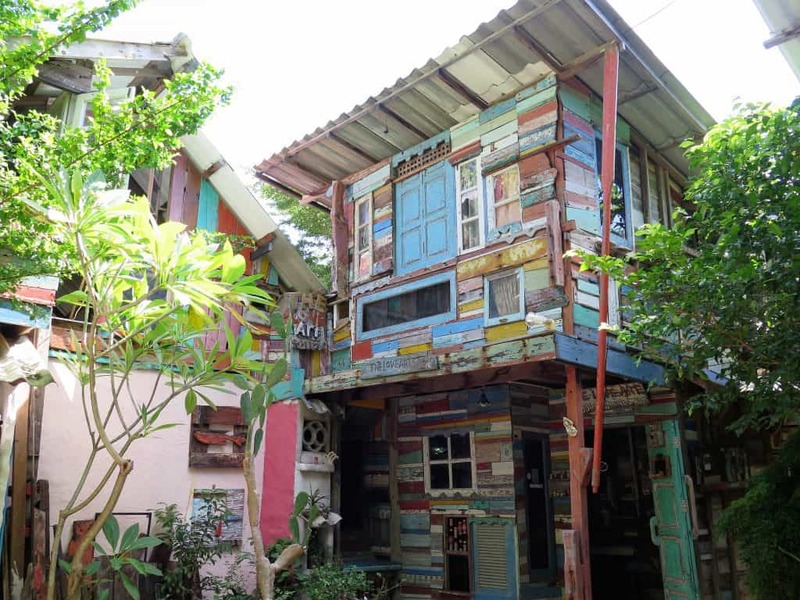 With a multi-coloured lofty structure built with recycled wooden planks, Khun Pui’s studio is the most noticeable in the village. And with each passing year, it has new quirky additions. Inside is a maze of rooms, each full of a bewildering array of art pieces in various styles and stages of completion. Trash turns into art treasure pieces in Khun Pui’s hands. He vividly describes his philosophy of art in a paragraph painted on an interior wall. He sees discarded objects as items full of potential, and his focus is on reincarnating the objects – giving them a new life. Khun Pui believes that even objects discarded as “junk” retain an essence or spirit that he intends to revive, giving them a new function, story and form. Driftwood fashioned into tropical fish at the Niran Gallery, Phuket Art Village. Khun Niran was born in the northern Thai city of Chiang Mai, but has lived in Phuket for several years. His art reflects his captivation with the Andaman Sea. Part of his studio displays luminous oil paintings of fishermen and ocean imagery. 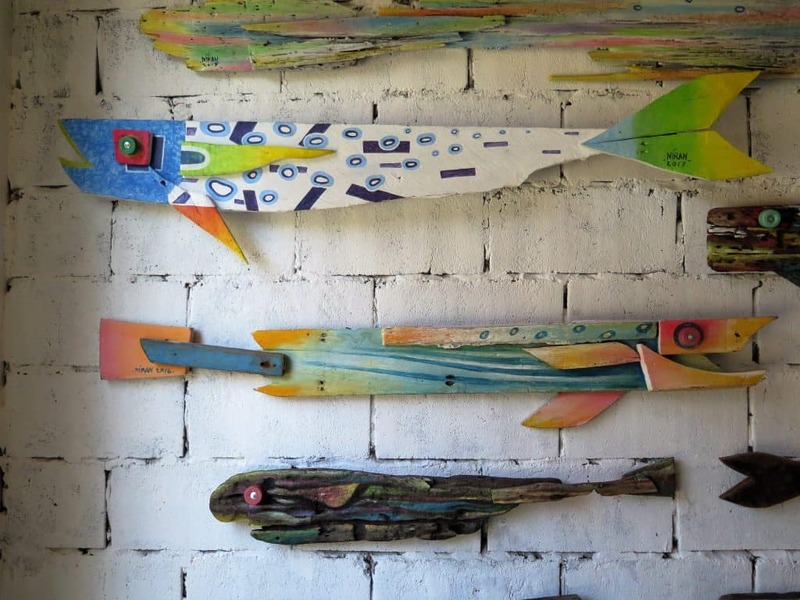 He also creates wall hangings made from driftwood, with expressive faces and tropical fish painted in cheerful pastel tones. Several art shows around Thailand have exhibited this award-winning artist’s works. Surreal images and vivid colours at the Red Room Gallery, Phuket Art Village. 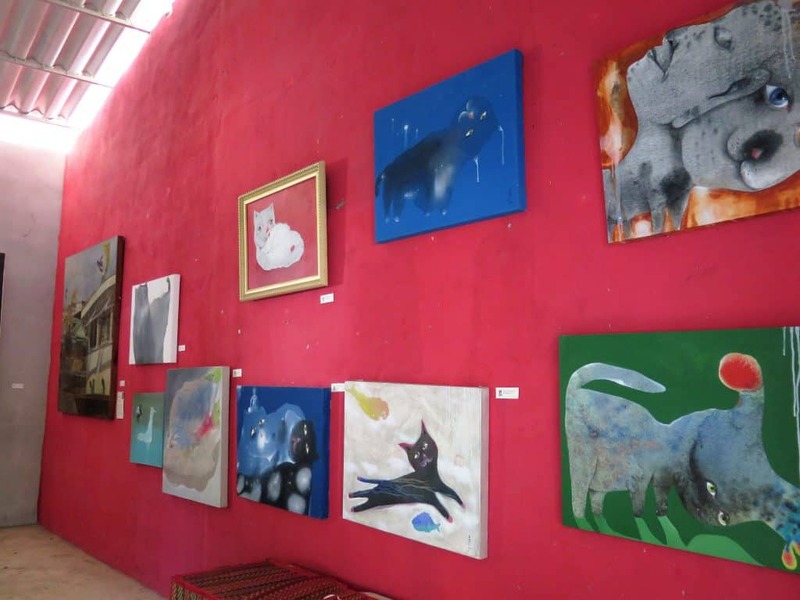 Displayed on Khun Somrak’s red gallery walls are several paintings with a surrealist touch, mostly of bright-eyed cats. The Krabi-born artist now lives in Australia but his Phuket studio at the village remains open. His works are also on exhibit at Gallery Salamanca in Tasmania.